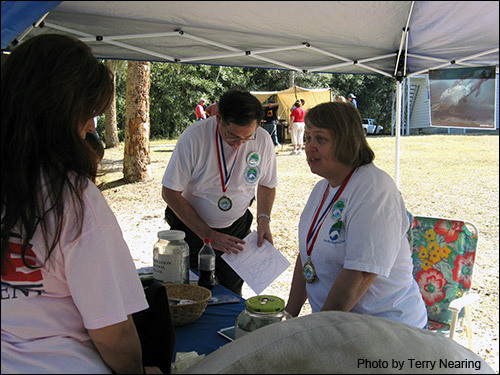 Deb and Doug Brown working hard volunteering after receiving their Manatee Hero medals from the Club. One day in 1988, Floridians Deb and Doug Brown decided it was time to roll up their sleeves and get busy – endangered manatees, after all, were in need of some serious attention. Out of that singular moment grew the Browns 24-year commitment to volunteering for Save the Manatee Club. Whether tabling at events around the state, giving manatee presentations, attending public meetings, helping at fundraisers, stuffing envelopes, building a display, even an interactive puzzle – they have greatly assisted the Club and the manatees, whom they wholeheartedly treasure. Staffing manatee education tables around the state is something the Browns thoroughly enjoy. When asked what drives them, what keeps them volunteering for over two decades, Deb & Doug say they have a “service ethic” which compels them to push to do as much as they can for the manatees. 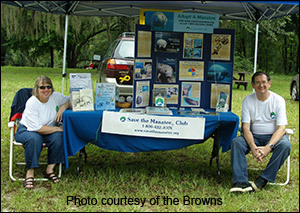 In 2009, Save the Manatee Club awarded the Browns with Manatee Hero medals to honor these exceptional volunteers for their outstanding commitment to manatee education and public awareness. 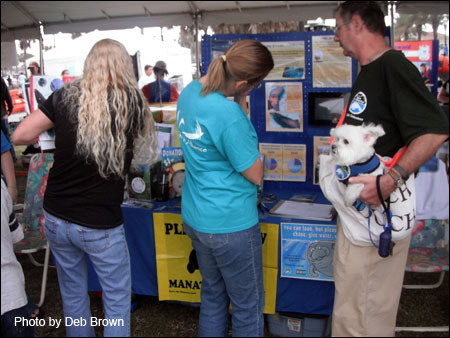 Doug and family pooch “Tia” Brown tabling at the Right Whale Festival in Jacksonville, Florida.